March was the fifth full month of availability for Microsoft’s latest operating system version: Windows 8.1 continues to steadily grow while Windows 8 managed to stay flat, allowing the duo together to finally crack 11 percent market share. 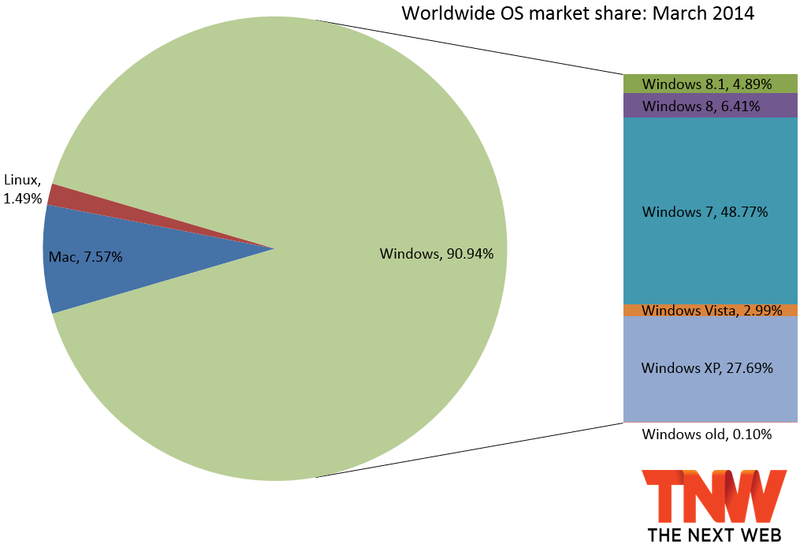 Meanwhile, with only a week left of support, Windows XP still has more than 27 percent of the pie. The latest market share data from Net Applications shows that Windows 8 and Windows 8.1 have gained a combined 0.62 percentage points (from 10.68 percent to 11.30 percent). More specifically, Windows 8 gained 0.03 percentage points (from 6.38 percent to 6.41 percent), while Windows 8.1 grabbed an additional 0.59 percentage points (from 4.30 percent to 4.89 percent). Meanwhile, Windows 7 outgained them both by jumping 1.46 percentage points (from 47.31 percent to 48.77 percent). After Windows 8 and Windows 8.1 did better combined than Windows 7 for three months straight, their predecessor has come back with a vengeance. Windows 8, which saw its biggest gain in August at 2.01 percentage points and its biggest loss in November at 0.87 percentage points, has not slipped for the first time in months. This is likely a blip as all Windows users are being encouraged to get the latest and greatest, and Microsoft is making the upgrade path to Windows 8.1 just a free download away for Windows 8 users. Going back to earlier versions, Windows Vista fell 0.11 percentage points (from 3.10 percent to 2.99 percent). Windows XP meanwhile managed to drop a solid 1.84 percentage points (from 29.53 percent to 27.69 percent). Unfortunately for Microsoft, most of those users chose to go with Windows 7. In 2013, Windows lost share every month except for March, July, and November. So far in 2014, Windows slipped a bit in January, gained in February, and took another 0.10 percentage points (from 90.84 percent to 90.94 percent) in March. OS X slipped 0.11 percentage points (to 7.57 percent), while Linux gained 0.01 percentage points (to 1.49 percent). Net Applications uses data captured from 160 million unique visitors each month by monitoring some 40,000 websites for its clients. StatCounter is another popular service for watching market share moves; the company looks at 15 billion page views. To us, it makes more sense to keep track of users than of page views, but if you prefer the latter, the corresponding data is available here (Windows 8 is at 7.24 percent). Read next: HTC One (M8) review: Like the HTC One, but better. And that could be its problem.